On Saturday 12 May I was most humbled to receive from Amnesty International the 2012 Human Rights Defender Award. There were many other strong nominees (see below). I thank the many people who have sent messages of congratulations since I was given the award. 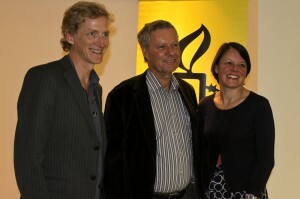 With Amnesty International's new Executive Director Grant Bayldon and Chair Helen Shorthouse after being presented with the Human Rights Defender Award. Keith Locke was tonight announced as the recipient of Amnesty International Aotearoa’s Human Rights Defender Award. In a ceremony at the Human Rights Commission in Auckland the award was presented to the former Greens MP in recognition of a life dedicated to the promotion and protection of people’s human rights here in New Zealand and around the world. “When we at Amnesty speak to communities or people here in New Zealand who have also sought our advice and help, Keith’s name is often mentioned as someone who has unfailingly assisted them,” said Rebecca Emery, Deputy Director at Amnesty International. “The award is emotional for me because it’s an award from my peers, said Keith. Keith acknowledged the other award nominees as they are all people he’s worked alongside and has great respect for. “I’m very humbled for receiving this award and it will be treasured,” said Keith. Keith Locke’s political journey has been a colourful one and he has been at the forefront of speaking up on numerous issues, which other MPs have shied away from, such as Tibet, East Timor, Sri Lanka, China and numerous issues in the Middle East. Amnesty commended Keith for being a domestic watchdog in the areas of search and surveillance issues, anti terror and refugee issues, including his tireless campaigning for the rights of Ahmed Zaoui. “The high calibre and diverse range of nominations received this year is testament to the recognition that the defence of human rights in our part of the world is as crucial as it is to the rest of the world,” said Rebecca Emery. : The nominees for the 2012 Human Rights Defender Award included Journalist/War Correspondent, JON STEPHENSON, Leader of Dewan Adat Papua (DAP) FORKORUS YABOISEMBUT, Former Chief Human Rights Commissioner in NZ, ROSSLYN NOONAN, Director/Producer/Co-Editor & Producer/Subject of the film Brother Number One, ANNIE GOLDSON & ROB HAMILL, Barrister & Founder of Slave Free Seas, CRAIG TUCK, Human Rights Advocate, MARIANNE ELLIOT, and Asylum Access Thailand, MICHAEL TIMMINS. The judging panel for the Award included Dr Judy MacGregor of the Human Rights Commission, Meg Poutasi of Pacific Cooperation Foundation and Rebecca Emery, Deputy Director at Amnesty International. “Human Rights Defenders are vital in the current New Zealand fabric, it is they who help keep the government honest and give others a voice,” said Dr Judy MacGregor. Interview with me and Amnesty Deputy Director Rebecca Emery on TV3 Firstline on 14 October.